(Secure Hypertext Transfer Protocol) we may name it wishing for anonymity? somebody with a second skin? Will they want to join him? We need volunteers, person-objects of Anonymity. It’s like a multicolored dump, but the Artist this time is not in it. What happens if He’s the only one not having fun? in which the Artist meets the mass and at the same time is in conflict with it. Now the Artist places himself on the opposite side as an orchestral conductor, necessary, but invisible. The revelation will happen in the exact time of a performative dinner, as the sound of a gong. In an “exact time” that the ancient Greeks call “Kairos”. to meet up, naked and covered (to say it with an oxymoron) by a second skin. Artist of the relation to the other, winner of a residence at the Cité Internationale des Arts in Paris in partnership with the City of Paris, Giuseppe L. Bonifati questions our society that standardizes, clears singularities while the communities are trying to assert themselves with their clothes, their customs and beliefs. Between the Cité Internationale des Arts in the heart of Paris and La Fabrique des Pépinières in Montreuil, Giuseppe L.Bonifati finds men and women from around the world. They intersect, coexist, but do not seem to communicate. 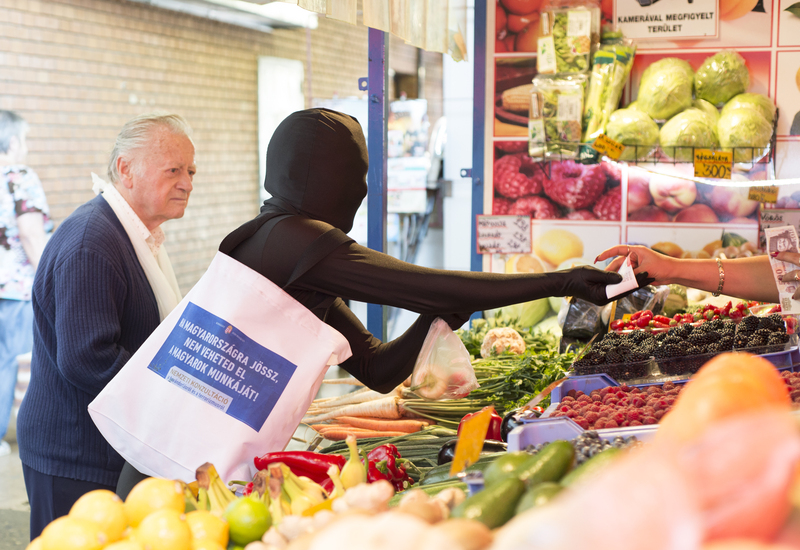 To generate possible encounters, Giuseppe L. Bonifati develops a paradoxical approach, borrowing a Zentai suit, a combination that covers the body in its entirety. A synthetic and garish skin which prevents to identify the wearer. In this outfit, insulated and plunged into a situation of loneliness, Giuseppe L.Bonifati stays in observation and waiting position in different places of the city. Emmanuelle Levinas «autrui est visage». In Hungary, suddenly one of Europe’s most anti-immigration nations with its planned border fence, it’s hard to say. Public opinion has swung against migrants in a year when thousands of asylum seekers have entered Hungary. A poll in April found that almost half of Hungarians classified themselves as anti-immigrant.The surge in xenophobia has also coincided with a pointed government campaign, running a Hungarian-language billboard that stir up xenophobic attitudes. “if you come to Hungary, you should not take Hungarians’ jobs”. Few weeks ago, coming back to Budapest, this has been the welcoming message for me too. I therefore decided, as Artist, to react to all this plunged into my new black skin. now more than ever so necessary in this country, as in all of Europe. The last part of the project is composed by a Workshop + Final Performance with local participants. Before the conclusive performance, the group will produce several urban actions, walking through the streets of the City, interfering with the social routine and calling the attention of passengers. “The Master of Ceremony sits at a long table with a special dinner for selected guests, locals and foreigners, these last completely covered by a second skin, but somebody ruins the banquet. Among them he proves to be an intruder: the Different. Who, under a second skin, will reveal a third one.